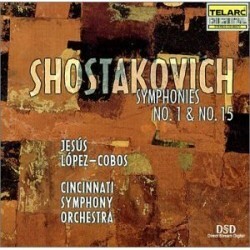 For his penultimate recording with the CSO on Telarc, Lopez-Cobos leads the orchestra in "bookend" performances of the first and last symphonies by Shostakovich. Born in 1906, Dmitrti Shostakovich lived for all but the first eleven years of his life under the communist system of the former Soviet Union. In his early years as a composer, the Soviet government kept a wary eye on the meanings of works produced by Russian artists and some of Shostakovich’s works came to be understood as musical statements of Soviet nationalism and optimism—a supposition that has inspired considerable debate. Late in life, however, with Cold War tensions failing, Shostakovich turned away from political to personal meanings. These two symphonies display this evolution in the composer’s style. The First was composed as a graduation piece and was finished before he turned 19. It shot the young composer to immediate world attention; within two years of its premiere in 1926 the symphony had been performed across the Soviet Union, introduced in Germany by Walter, and in America by Stokowski and Rodzinski. It is dedicated to fellow student Mikhail Kvadri, who later became the first of Shostakovich’s friends to die in Stalin’s purges. The Fifteenth Symphony is one of the composer’s most internal and enigmatic works, and is notable for its quotations from other sources, including the overture to Rossini’s opera William Tell and Wagner’s Ring cycle. Composed in just two months in the summer of 1971, it was premiered in Moscow in January of 1972. Full orchestra is used sparingly, with much of the music given to solo instruments or small ensembles within the orchestra. Upcoming on Telarc will be Maestro Lopez-Cobos’s final recording as Music Director with the CSO, in a program devoted to his Spanish heritage featuring works by Debussy (Iberia) and Turina.